Door Defender the car door protector set up Instructions for using on your vehicle. This car door protector comes in two sets. One set for both driver side front and rear doors and one for the passenger side doors. The below vehicle door protection placement instructions are the same for both sides of your vehicle’s doors. Remove the Door Defender protector from its nylon storage case (included with product). Place the car door protector on the rear door first. Put the PVC coated security cable (this is the cable in between both the padded foam pieces) inside of your vehicle and close your front door on it. Place the other side of the Door Defender on your front door. Adjust the height of the car door protector on your vehicle. For example: for a sports car it will have to be higher up and on a large SUV it should be positioned lower. Repeat steps 2 – 5 for the passenger side doors. The Door Defender protector is made of special foam that is shock absorbent, high force magnets to hold them in place and adaptable PVC coated cable for security. Note: The car door protector magnets are covered with a pad and will not leave any markings on your vehicle. 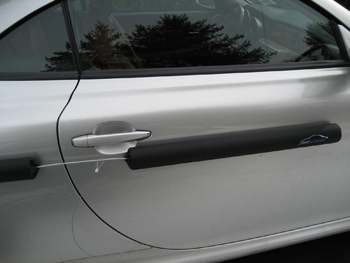 Also this auto door guard is weather proof and will not leave any color markings on your vehicle. As with all the auto protector guards on BumperArmor.com this car door protector product has been tested and meets our high standards of vehicle protection.